Despite Mark Zuckerberg’s protests, 2017 Facebook is more than a social media platform. Marketers, media entities and Facebook participants pay attention! Facebook is a media titan in the traditional sense of the word. 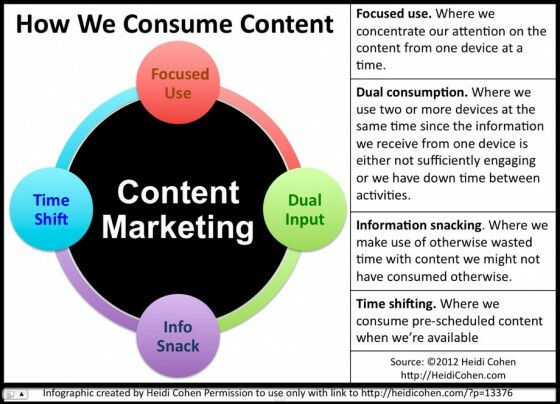 It has an audience that consistently spends time with content delivered on a regular basis to yield advertising revenues. How to provide an improved, competitive audience experience? How to improve its content quality and reduce fake news? How to develop other revenue sources? Regardless of business size or focus, Facebook is a necessary element of your marketing plans. Facebook helps reach and define a broader audience. Facebook supports your community and encourages engagement. Facebook enables you to test and distribute your content marketing cost effectively. To stay current and maximize your marketing results, you must know the following 2017 Facebook Facts. Based on Facebook’s 3Q2016 reporting, over a billion people log into the social media platform daily and almost 2 billion people check in monthly. 1.79 billion people use Facebook monthly (aka:Facebook MAUs) worldwide as of 3Q2016, up 16% since 3Q2015 If you had any doubts, Facebook is too big to ignore regardless the size of your marketing budget. 1.18 billion people log onto Facebook daily (Facebook DAUs) as of 3Q2016, up 17% since 3Q2015. A growing number of Facebook users are active daily. 1.66 billion people access Facebook via a mobile device (aka: Mobile Facebook MAUs) as of 3Q2016, up 20% since 3Q2015. 1.03 billion people access Facebook via a mobile device daily (aka: Mobile Facebook DAU) as of 2Q2016, up 22% year-over-year. What does 2017 Facebook audience mean for your marketing? Facebook’s audience continues to grow and engage. Further, their users visit daily mainly via smartphones. Chances are you need its broad global reach. Facebook instills friends and colleagues with FOMO (aka: Fear of Missing Out). Consider how your business can engage your targeted audience to share their best moments with their friends and connections. The average Facebook user has 155 connections of which 28% are genuine friends. In an emergency, a user would trust a mere 4 of those people according to the Telegraph. These numbers are close to the Dunbar number. 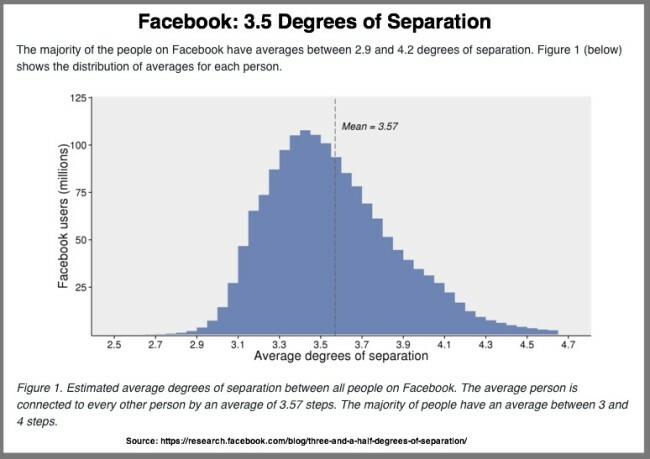 Using the Kevin Bacon 6 degrees of separation approach, you need Facebook because it has 3.5 degrees of separation. BUT beware: 83 Million Facebook profiles are fake. While there may be valid reasons for this, they’re still phony Facebook accounts. From a marketing perspective determine if your community contains fake users. If so, what are they doing and what are they costing you? What do 2017 Facebook connections mean for your marketing? Think “micro-influencers.” Aggregate smaller audiences rather than depending on a massive influencer audience where there’s limited connection. Why? People with small reach may have deeper connections with each person. Determine how your most involved followers use Facebook. Then assess how your business can be part of that engagement. Facebook doesn’t just attract a large audience. Its participants spend time there. On average, we spend 50+ minutes per day on Facebook’s various apps (excluding WhatsApp) according to 1Q2016 earnings report. To put that into context, that’s almost an hour a day. YIKES!!! 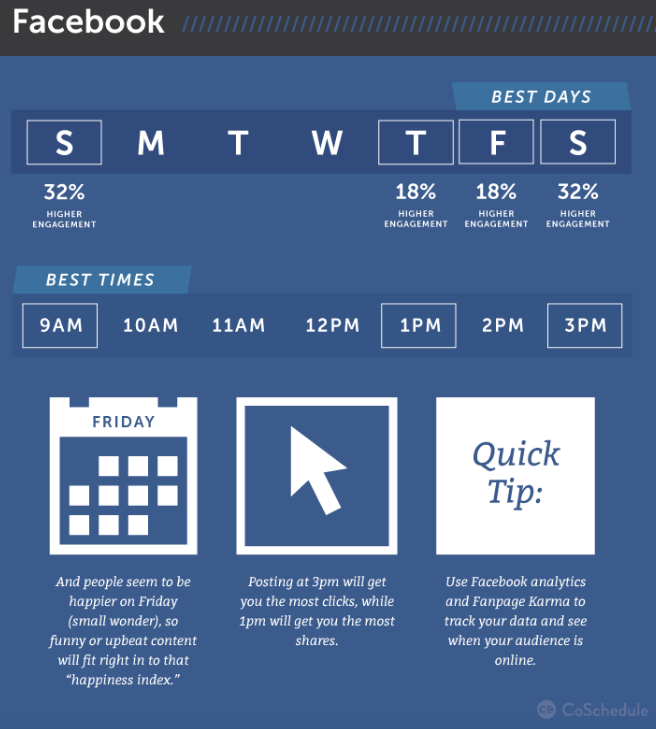 To put that in context, we spend roughly one hour per day on Facebook. That’s about 8% of our waking hours. As a marketer, you’ve got an opportunity to reach your followers and others by posting content on Facebook. BTW, Check out The Social Media Hat’s Mike Alton‘s guide to help you repost other people’s content on Facebook. What does 2017 Facebook time-on-site mean for your marketing? Facebook’s audience checks in throughout the day. It can be a break from work or to catch up with friends. It’s not once-a-day media or appointment media time. You must consider your Facebook post timing. Facebook usage tends to be a filler activity or dual media usage. Your Facebook audience may not be focused on what’s happening. Facebook took a lot of heat after the US election for not ferreting out fake news. Other user-generated content sites such as Yelp are criticized for a lack of integrity (aka: gaming the system) and lack of editorial oversight. While Zuckerberg wants to keep his algorithms, Facebook needs human editors. At a minimum, Facebook must respond to the public concerns as well as those of its users. Facebook misses the irony that 12+ Facebook employees manage Mark Zuckerberg’s personal Facebook account! 12+ employees manage Zuckerberg’s personal #Facebook account! Huffington Post has shown that a media entity can offer a combination of traditional journalism, curation and user-generated content. From a competitive perspective Facebook will need editorial oversight and original content to remain competitive. This will create a fine line for other media entities that leverage Facebook for audience amplification. 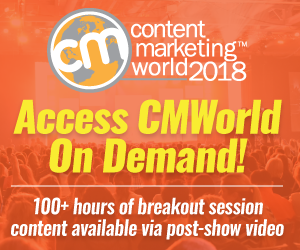 While video continues to be a key element of Facebook’s growth for marketers and users, Facebook must create quality content to remain competitive. This competition isn’t just Google’s YouTube. It’s also Amazon and NetFlix. Facebook is examining video, specifically scripted shows, game shows and sports. Ricky Van Veen, the College Humor co-founder who joined Facebook in 2016, is leading these efforts. Some of these livestreaming deals exceed $1 million per year but these investments are significantly less than Amazon and NetFlix. 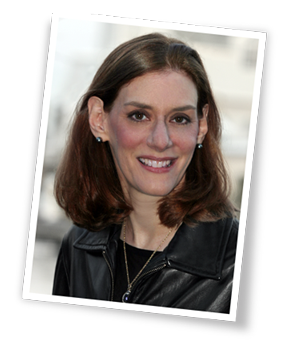 From a marketing perspective, follow the experts like Mari Smith to stay ahead of Facebook’s changes. 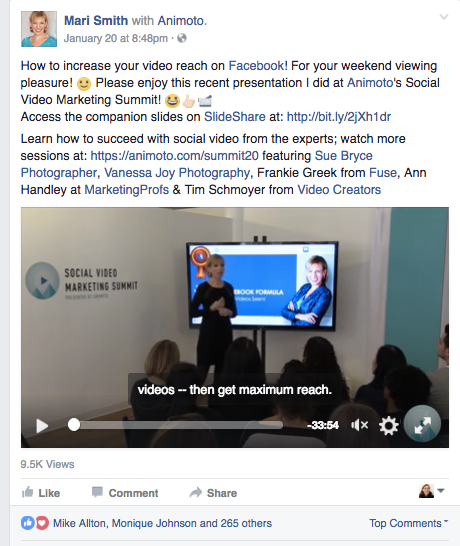 What do 2017 Facebook video mean for your marketing? Facebook video could provide another revenue stream in terms of subscription fees or advertising. Both types of revenue would add a competitor to viewers’ attention as well as marketing opportunities. Facebook needs to improve its search functionality. Search is both a form of content and a revenue generator. Currently Facebook enables people and location search. Google dominates the search realm. From an advertising basis, 2016 was the year that digital display advertising passed search advertising according to eMarketer forecasts. From a competitive perspective, this is a major issue for Facebook that doesn’t produce any form of hardware, namely a smartphone like Apple or virtual assistant like Amazon’s Echo. Even Microsoft has Cortana. 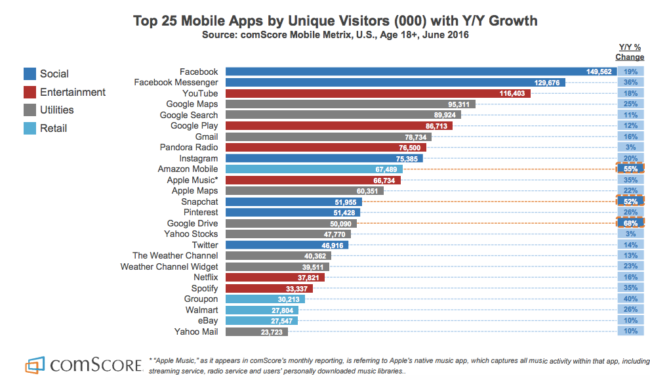 While the Facebook app is installed on the majority of smartphones, they’re not part of voice search. What does 2017 Facebook search mean for your marketing? Short term, Facebook search won’t have an impact on your marketing plans but be prepared to test it when Facebook starts to offer improved search functionality. Media companies have 3 major sources of revenues: advertising, subscriptions and one-off products (like conferences). Like many of its peers, Facebook depends mainly on advertising to generate revenues. Facebook reached second place behind Google as the biggest advertising media entity in 2016. WPP’s Sir Martin Sorrell reported this in December 2016. Google and Facebook together control 75-85% of digital advertising based on IAB and Deloitte research according to Jason Kint’s estimates. Facebook announced improvements to its advertising metrics to improve advertising relations in November 2016. While this is a step in the right direction, it means marketers must supplement Facebook metrics with other tools. 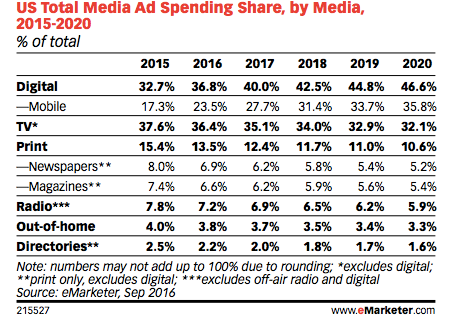 To put this in context, US digital advertising passed television in 2016 according to eMarketer. 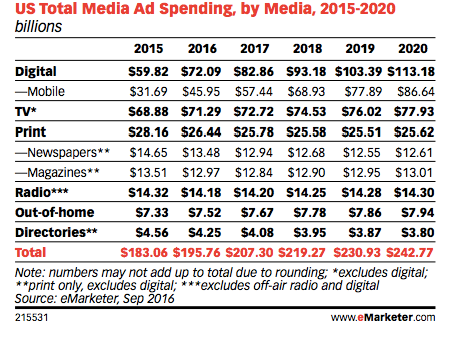 US digital advertising reached $72.01 billion in 2016 compared to $71.29 billion for television advertising. Of this digital total, Facebook and Google account for 57.6%. Digital display ads passed search for the first time in 2016. In 2Q2016 Facebook CFO David Wehner reported they were close to maxing out the optimal number of ads showed inside the newsfeed. Translation: Facebook needs to increase users and advertising effectiveness. In 3Q2016, Facebook increased desktop advertising delivery by creating an ad blocking work around. 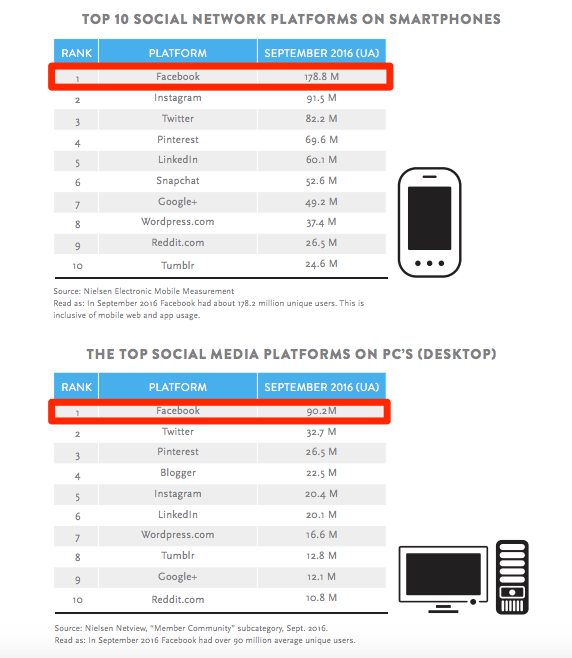 While this is key, Facebook usage continues to shift from desktop to mobile. To expand revenue opportunities, Facebook announced that they’re looking at mid-stream video ad placement. BUT the mid-stream ad effectiveness is still untested. Facebook could take a page from the television advertising playbook. They could put ads at the bottom of Facebook video. Yes it’s small space but if a user wants to see the video, they’ll let it take over their screen. Unlike pre-roll ads, it’s persistent while the user is viewing the video. 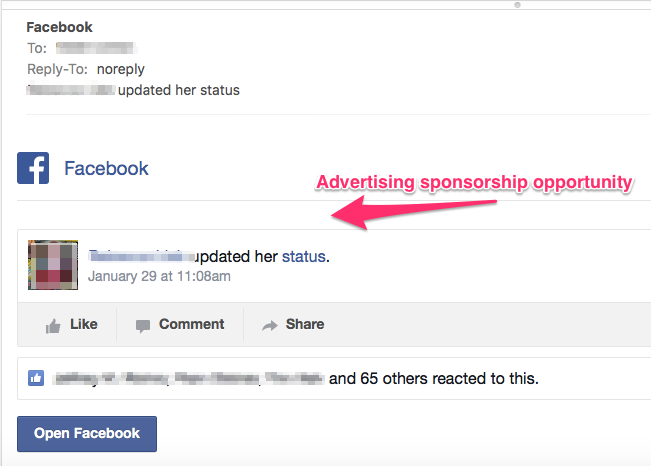 Additionally, Facebook could add sponsorships to Facebook emails. These messages lure users back to the platform see what connections are doing. It’s email that gets above average opens. Facebook could add sponsorships to its emails. For more information on Facebook marketing engagement, check out BuzzSumo. What does 2017 Facebook advertising mean for your marketing? Facebook requires investment. Even the smallest firms, must invest in participation and advertising. Buffer’s research underscores this point. Facebook advertising prices will continue to increase. There’s higher demand for limited space. It’s economics plain and simple. Facebook advertising taps into the power of micro-data. This allows marketers to fine-tune their advertising targeting yielding, in turn, cost-effective marketing testing and reach. It’s micro-data at its finest. Further, using data in this way keeps users from complaining about the information capture. Facebook advertising usage is opaque. 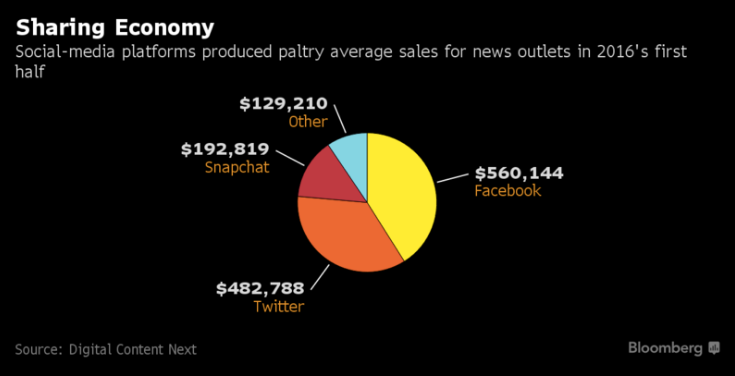 Unlike traditional media where major brands or political use is reported, Facebook’s isn’t. The obvious example was the US election. Third-party media entities (like The New York Times, The Washington Post, BBC and Bloomberg) found that Facebook distribution of their proprietary content yielded weak results and hindered direct relationships with their audience in 2016 according to Digital Content Next. Facebook doesn’t offer video ad products that scale for TV/cable companies. It doesn’t integrate ad serving and third-party measurement. Facebook Instant Articles restrict the number and types of ad units. As a result, publishers can’t monetize their content that appears on Facebook at rates comparable to their own platforms. Facebook Live has neither scaled nor proven their revenue model beyond the publisher production guarantees. What does 2017 Facebook media distribution mean for your marketing? Facebook may have less quality content on its platform as media companies rethink their distribution for improved revenues. Media companies need to figure out new ways to reach and build their audiences. Owning your audience is crucial, especially in light of continued expansion of content marketing. Large corporations have big budgets to buy existing media entities and to hire experienced journalists. Media entities must reassess their revenue models to find new ways to drive profitable sales. Advertising alone isn’t enough, especially to pay for quality editorial staff. Facebook’s revenue streams are focused on advertising. Fortunately, they continue to experience strong growth in users. Additionally, their investments in Instagram and WhatsApp continue to contribute to their bottom line. But at some point, Facebook has to consider other methods for driving revenue diversification, most notably subscriptions and one-off-products to create predictable sales. Love Facebook or hate it—your 2017 marketing needs to tap into the power of this media power house for community building and engagement, for paid advertising, and for content testing and distribution. It’s a matter of sheer size. Regardless of your audience’s needs or wants, the chances are they’re active on Facebook. Even more importantly, they’re connected to other people who may need your product. This helps your marketing with the influence of their friends and others. To maximize your 2017 Facebook results, invest in content and participation for your Facebook community as well as advertising. Tags Bloomberg, BuzzSumo, comScore, CoSchedule, eMarketer, Facebook, Jason Kint, Martin Sorrell, Mike Alton, Nielsen. Bookmark the permalink. ← Generate New Blog Post Ideas: Yes You Can! 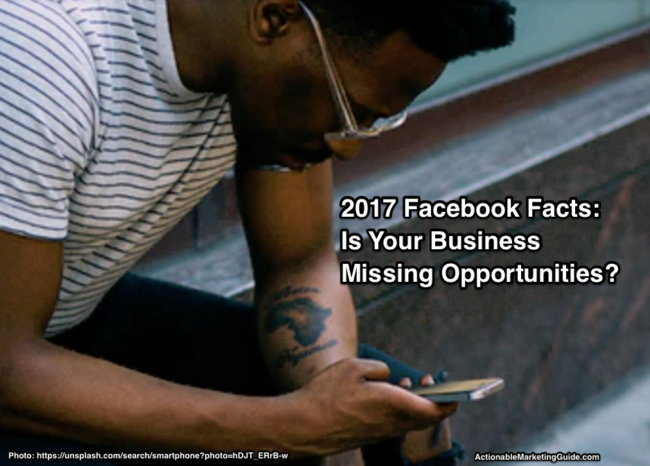 4 Responses to 2017 Facebook: Is Your Business Missing Out? Love the post. Very excited to see what facebook has in store for marketing needs. 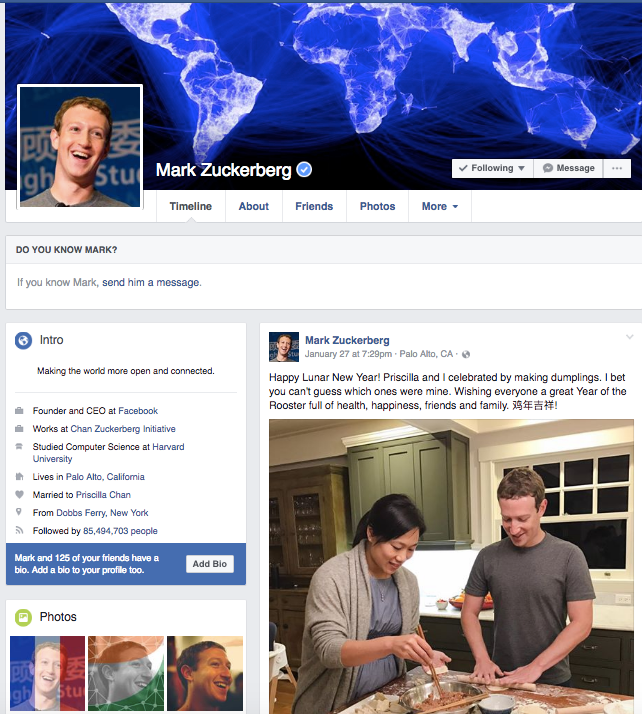 Mark is planning big things for facebook to have it more than a social media platform.